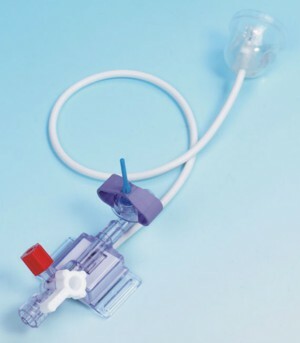 A variety of companies make medical pressure transducers which all adhere to the same electronic standard: AAMI BP22. The Abbott Medex connector is RJ11 compatible, allowing great flexibility in cabling and panel jacks. We do not use proprietary medical cables. On a 4-pin RJ11 male plug, from the end, latch up, pin 1 is on the left. We gave up on these as unreliable. Signal bounced around by up to 30 mmHg. Model 07356-00, sealed stainless steel, 15 psig, 1-5 V out, 10-30 V power. Gauge pressure rather than absolute pressure, meaning that it's relative to atmospheric pressure. A metal luer lock adapter is screwed onto the end, onto which a liquid isolator is attached. In many situations a simple analog manometer is used. This is always available as a backup in case the computer hardware or software is not functioning or is unavailable. Ours is an American Diagnostic Corp sphymomanometer gauge. It should not be exposed to liquid, so the tubing is coiled about 4 times. As a result, any liquid can clearly be seen and blocked before it reaches the gauge. These are known to go out of calibration easily. If the needle is not exactly centered in the oval at zero, then you will need to add or subtract on the fly to obtain the most accurate numbers. Because of the mechanical limitations of the analog manometer, it is never used as the primary instrument during a case. Once calibrated, digital pressure transducers are more accurate.